The office at the Glen is open from 8am-3pm Monday – Friday. If you ring outside these times the phone may be answered by clients in the program and not staff members. Click here to watch a short film explaining exactly what The Glen program is about. 1994 Ngaimpe Aboriginal Corporation was registered (and set up The Glen). Since that date it has been an example of the triumph of the Koori and the human spirit. The Glen is evidence that dreams can come true. 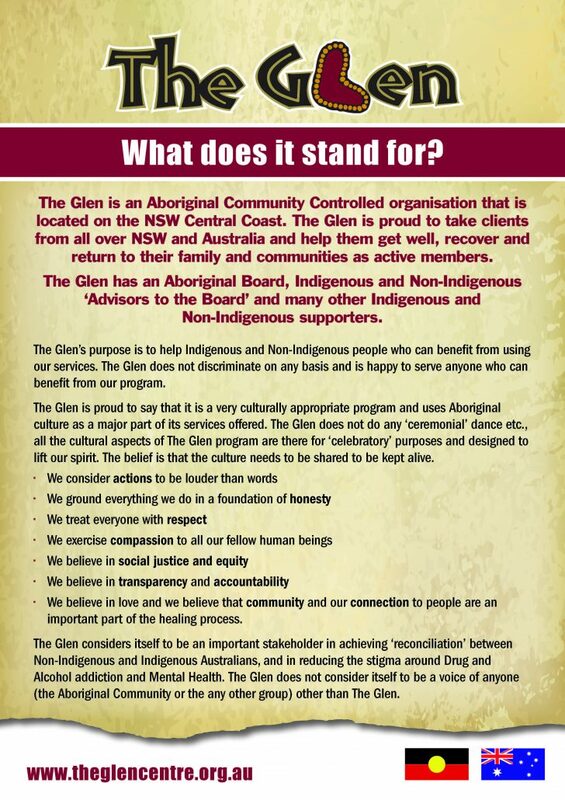 The Glen is proud to be a Central Coast based service that provides Drug and Alcohol Rehabilitation opportunities for men (indigenous and non-indigenous from all over NSW). The founding motivation for The Glen was the suffering of the community at the hands of drugs and alcohol addiction. The Glen was and still is today, especially interested in trying to get men (indigenous and non-indigenous) out of the criminal justice system and into treatment for their drug or alcohol addiction (which causes the offending behaviors). There has and continues to be an over representation of Indigenous Australians in the prison system. There are hazardous levels of use of alcohol and other substances by Indigenous Australians. There are lower levels of participation in education and employment by Indigenous Australians compared to the general population. The Glen’s program is designed to treat a client in a holistic manner to address their issues. This means treating the person as a whole (spiritually, mentally and physically). It also means trying to not just treat their addiction but the things that may be causing the addictive behaviours. The Glen’s program about trying to empower people to take control of their lives, to live a good fun life, and to become active members back in their families and the community as a whole. Our program is based on indigenous values and spirituality with a heavy emphasis on the individual and the consequences of the individual’s choices. It includes group sessions, one to one counselling, work programs, sport and self help meetings. The original ‘The Glen’ was established on disused land at Chittaway in 1994. This site is located on 40 acres and is now a modern rehabilitation facility that has 37 residential rehabilitation beds (includes transition beds). The Transition House (Halfway House for people who have completed our basic rehabilitation program) was established at the Chittaway site in 2010. We are staffed by 16 full time, part time and casual staff and a team of volunteers. We’re a QIP accredited organisation and in 2015, set a national benchmark for health and community standards, by exceeding 6 of the standards. The Glen welcomes all men over the age of 18 who could benefit from our program. The Glen is proud to be an organisation that helps break down the barriers between indigenous and non-indigenous Australians and works towards reconciliation. We acknowledges while Indigenous Australians are struggling with drug and alcohol abuse issues, it is a common problem in all aspects of modern Australian society. Addiction doesn’t discriminate on the basis of colour or anything else. Please refer to our intake criteria on our application page.